In his Robin Hood trilogy; King of Sherwood, Arrow of Justice and Freedom’s Outlaw, I.A. Watson brilliantly re-imagined this classic adventure saga by setting it against England’s actual history. Much to the delight of fans everywhere, old tales became new with fresh insights into the origins of the legend and its colorful characters. Now Airship 27 Productions is thrilled to bring you this Special Fourth Volume as a bonus finale to that trilogy. In this volume you will find a handful of short stories published here for the very first time; maps of England and Robin Hood’s London plus more of the author’s in-depth essays on his critically acclaimed series and a Robin Hood comic strip illustrated by Pulp Factory Award winner, Artist Rob Davis. 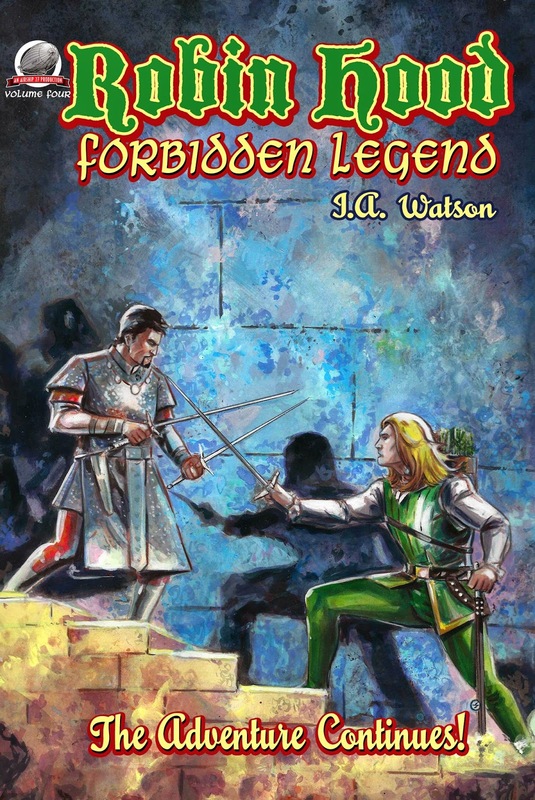 Robin Hood – Forbidden Legend also denotes the release of new, re-edited editions of all three previous titles; each now accompanied by period maps relevant to each chapter in this glorious series. Robin Hood and his Merry Men, heroes for all ages! Features a cover by Jesus Rodriguez and interior illustrations by Pulp Factory Award winning artist, Rob Davis. Airship 27 Productions locks all the doors and dims the lights as it prepares a deliciously twisted Halloween reading treat for pulp fans everywhere reviving a truly bizarre character. From the pages of the classic pulps comes the most frightening avenger of them all, the Purple Scar! The handsome, debonair Dr. Miles Murdoch was a world famous plastic surgeon. His life was the stuff of dreams until it all turned into a heart-wrenching nightmare. Murdoch’s brother, a dedicated police officer, is brutally gunned down while on patrol. Before dumping his body into the river, his murderers pour acid over his face as a final act of contempt. When the body washes ashore days later, Officer Murdoch’s face is beyond recognition, a scarred, purple visage unlike any horror ever imagined. It is the sight of this death grimace that transforms Miles Murdoch into an avenging angel. Vowing to bring justice to those responsible, the skilled surgeon molds a pliable rubber mask from that repulsive, mutilated face; a mask he dons to become the Purple Scar, the scourge of crooks and villains everywhere. He has become the physical embodiment of their worst fears brought to fiendish life. Airship 27 now presents four brand new adventures of the creepiest pulp hero of them all, the Purple Scar! Jim Beard, Jonathan Fisher, Gary Lovisi and Gene Moyers have all stirred the witches cauldron deep to brew up a quartet of frightening mayhem as only the Purple Scar can deliver. 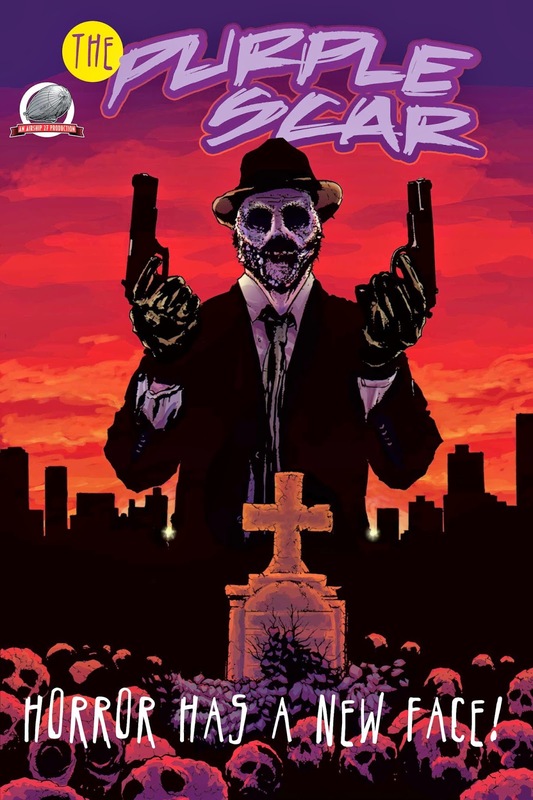 Add the beautifully grotesque art style of Richard Serrao, Shannon Hall’s amazing cover coloring and Rob Davis’s spooky design motif and you have a new kind of pulp thriller unlike anything ever seen. Beware the shadows and dark alleys, the black cats and dancing skeletons as Airship 27 whips up a real Trick or Treat pulp chiller. Available at Amazon in both hard copy and on Kindle.